Here are some tips on making the most out of your planter box gardens this year. We have a lot of different planters to choose from and any one of them would make a lovely patio garden for you to enjoy. 1. Planter boxes are a wonderful new way to grow a garden and a tried-and-true way to enhance your walkway, deck, or patio. Whether you are using Wood Country’s Patio Planters or the T&L Planters, here are some quick tips to help you use any planter boxes to create beautiful, fruitful gardens. 2. Container gardens generally have fewer problems with insects, especially Wood Country’s cedar planter boxes because the cedar wood is naturally insect-repellant. Weeds are less of a problem as well, but even planter boxes should be inspected and weeded frequently. 3. Soil is of utmost importance and before you fill your planter boxes, be sure you are using an appropriate potting soil for the plants you’ll be growing. 4. 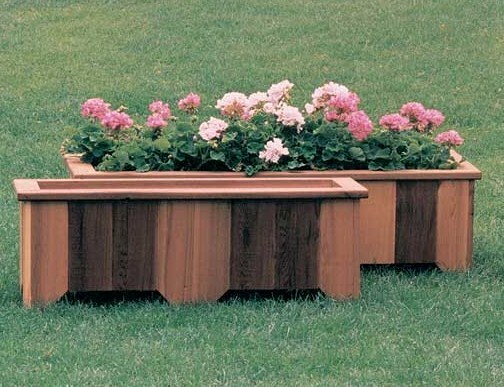 Wood Country’s cedar planter boxes enhance your landscape. Be sure the wood is stained or painted, and note that cedar is naturally rot-resistant. If you choose to use plastic liners, make sure there are plenty of holes in the plastic as these keep the soil from “breathing.” Plants love wood planter boxes. 5. Planter box gardens heat up faster than gardens in the ground, so think carefully about placement. How much sun will the plants get? How much rainfall? Especially with large planter boxes, you won’t be moving them around much once they’re planted.